If a picture is worth a thousand words, shouldn’t you be choosing carefully? A good image can make or break your content. Here are a few tips to selecting strong images. 1. Create emotion. The image should cause some kind of emotion—preferably, the one you’re aiming for. Talking about important legislation? A picture of people protesting angrily sends a way better message than a group of legislators sitting at a conference table. Highlighting an exciting event? Show people actively participating in the event rather than people posing next to the event signage. 2. Go natural. People posing with plastered smiles on their faces looks fake. They’re not really smiling and readers can tell. Instead, capture those people in mid-conversation or engaged in an activity. One could be gesturing while the other looks on laughing, or with focused concentration. 3. Reduce speech pictures. It’s easy and necessary to grab pictures of speakers at the podium with the brand on the podium, but try to get the speaker in mid-action somewhere else. Too often, the only images of important speakers are ones with a microphone blocking their face. 4. Make sure it’s crisp, clear, and well-lit. A blurry, poorly lit photo looks unprofessional. If it’s an old picture, and impossible to reproduce, don’t use it as the main image, but add it to the side as a supplement to a stronger, central photograph. 5. Write captions. All photos should include who, what, where, when, and why. People should not be confused about what is happening in the image. 6. Capture images of people at work. 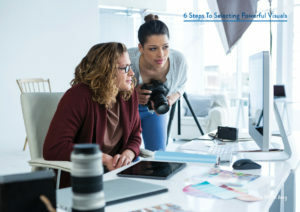 While conferences and meetings are easy ways to get pictures of people, you need photos for the day-to-day activities. For example, if you work for the housing industry, you’ll want to show images of people on construction sites and looking at blueprints, rather than holding a microphone. Placing the subjects in their element creates a more vivid story. Using powerful photos and images are a great way to grab a reader’s attention and draw someone into what you’ve written. By being versatile and selective in your options, you’ll be able to send your message more effectively than with weak, original or stock imagery.